It was a beautiful evening for lacrosse in Foxborough, Massachusetts where the Boston Cannons took on the Denver Outlaws, the 2014 MLL Champions. 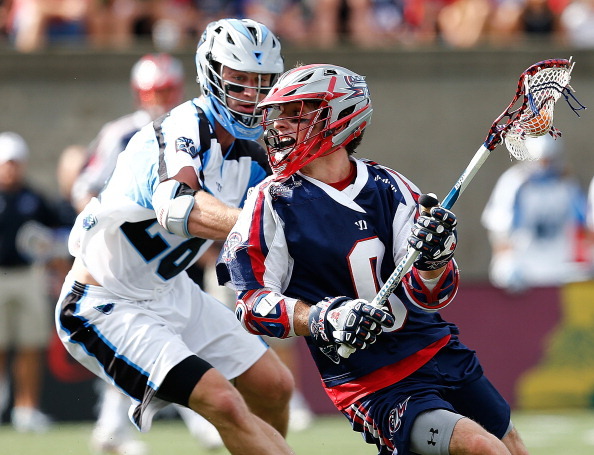 Last season, the Cannons handed the Outlaws their first home loss in two seasons on July 11th 2014. The Cannons were fired up for their first game at their new home, and to kick of the 15th anniversary season. In a high scoring showdown between two talented teams, the Cannons led on the scoreboard for most of the night and took home their first win of the season beating the Outlaws, 16-13. The first quarter ended 4-3 with the Cannons controlling most of the possession. The first goal of the season, scored byRob Emery, came just thirty-one seconds into the game. The Outlaws answered a few minutes later to tie the game at one. Goals from Davey Emala (assisted by Brent Adams) and Brent Adams (unassisted) gave the Cannons a two-goal lead. Denver responded with a goal from Bocklet, but soon after two of the Cannons captains connected when Will Manny found the back of the net off a Scott Ratliff feed. With less than four minutes remaining in the first quarter, the Outlaws scored to make it 4-3. The second quarter featured fewer goals than the first. Cannons scored early in the quarter on a Martin Bowes goal, with the assist dished out by Ryan Young. The Cannons defense was able to kill a thirty-second penalty, but with 6:28remaining in the half, Denver scored to cut Boston’s lead to one goal. Max Seibald, in his debut with the Cannons after being traded from the New York Lizards, responded with an unassisted goal less than a minute later. Emala andAdams both scored their second goals of the evening to push the Cannons lead to four. With 43 seconds remaining in the half, Denver netted a goal to make the score 8-5 going into halftime. Denver started the second half with a man up and was able to capitalize on their advantage early on, scoring just twenty-five seconds into the third quarter. Seconds later, the Cannons netted back to back two point goals, by Rob Emery and Josh Amidon, to take a six goal lead over the defending MLL champs. Two unanswered Outlaw goals cut the Cannons lead to four. With three minutes remaining in the quarter, Martin Bowes found the back of the net for his second goal of the night. One more Denver goal cut the Cannons lead to just four heading into the final quarter. The Outlaws came out on fire in the fourth quarter, scoring three unanswered goals in the first seven minutes as they continued to cut down the Cannons lead. Although the Cannons controlled most of the possession, the Outlaws were able to capitalize on their few offensive runs. Newcomer Seibald scored his second goal of the game with five minutes remaining, making the score 14-12 in favor of the Cannons. Two minutes later, he found the back of the net again to complete the hat trick and give the Cannons a comfortable three goal lead as the clock began to wind down. Less than thirty seconds before the final whistle, Manny finished off the Cannons scoring with his second goal of the night. The Outlaws netted one more before the end of the game. The Coca Cola player of the game was awarded to Max Seibald who finished the game with 3 goals. The Cannons return to action at home April 26th where they take on the Charlotte Hounds at Gillette Stadium at 4pm.